Maybe I’ve been spoiled by all the World Cup coverage, but it’s staggering to see the difference between the levels of play in the MLS — the top flight of American soccer — and the premier international tournament. Last night, I was dispatched down to Foxboro to cover the return of the MLS season after their so-called “World Cup” break, photographing the matchup between the Chicago Fire and the New England Revolution. It was just relentless long ball after long ball into the box with little discipline or creativity on the part of the players. Very frustrating to watch as someone who’s been playing this game his whole life. Here are some photos from the game, which the Fire won, 1-0. 6.27.2010 — FOXBORO, Mass. — Revolution defender Emmanuel Osei misses on his bicycle kick clear ahead of Chicago midfielder Baggio Husidic on June 27, 2010. 6.27.2010 — FOXBORO, Mass. 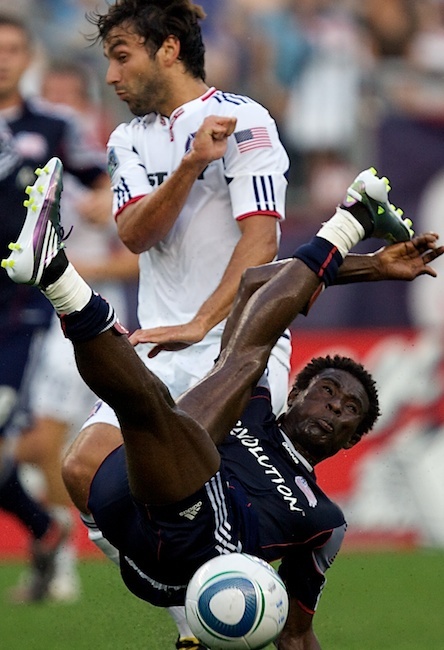 — Chicago Fire striker Brian McBride jumps over a sliding Emmanuel Osei in the first half against the Revolution on June 27, 2010. 6.27.2010 — FOXBORO, Mass. 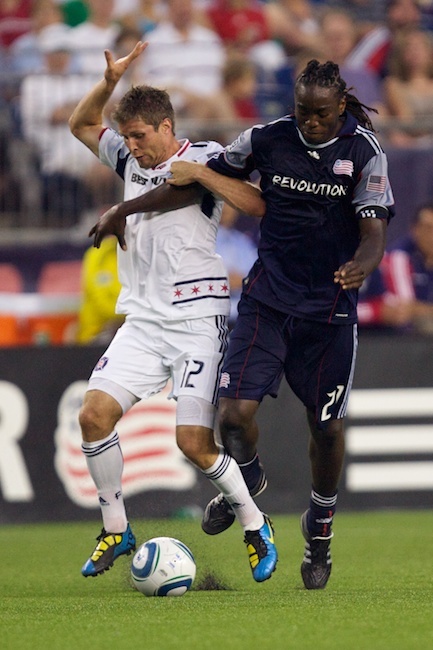 — Revolution midfielder Shalrie Joseph gets tangled up with Chicago defender Logan Pause in a 1-0 loss to the Fire on June 27, 2010. 6.27.2010 — FOXBORO, Mass. — Revolution striker Kenny Mansally wins an air ball against Chicago midfielder Marco Pappa in a 1-0 loss to the fire on June 27, 2010. 6.27.2010 — FOXBORO, Mass. — Revolution midfielder Marko Perovic shows his furstration after a missed opportunity in a 1-0 loss to the Chicago Fire on June 27, 2010. 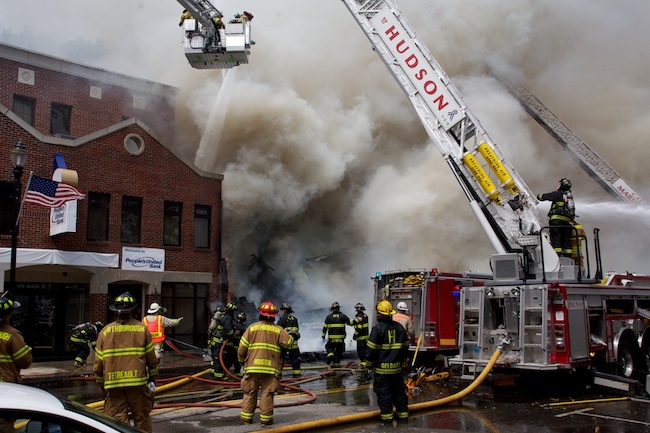 A little after noon Saturday, I got a call from the Herald to check out what was, at the time, a four-alarm fire in downtown Marlboro. Within a few minutes, the fire got much worse, hitting six alarms by the time I got there. Sure enough, I could see smoke billowing across the entire downtown area, coming from an apartment building with a diner and hair salon on the first floor. I’ve never photographed anything higher than five alarms, and that includes some pretty serious fires back in Tampa. I was pretty surprised when it hit eight alarms by the time I made my first frame on the scene. It didn’t look a whole lot worse than anything else I’d ever seen, but my guess it was due to the density of the buildings in the downtown area. According to Marlboro Fire Chief Rick Plummer, the fire started on the second floor of this old, wood-framed building and spread very quickly. So quickly, in fact, that this thing ended up imploding about an hour after I arrived. Here’s a sequence of photos of that, as well as some shots of the firefighters from multiple towns working the scene. 6.26.2010 — MARLBOROUGH, Mass. 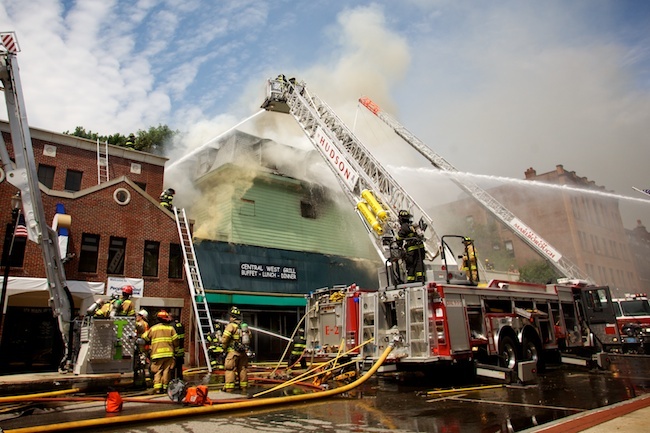 — Firefighters from multiple agencies, including Northborough, left, and Hudson, center, assist their Marlborough colleagues with an 8-alarm fire at 173 Main St. in Marlborough on June 26, 2010. 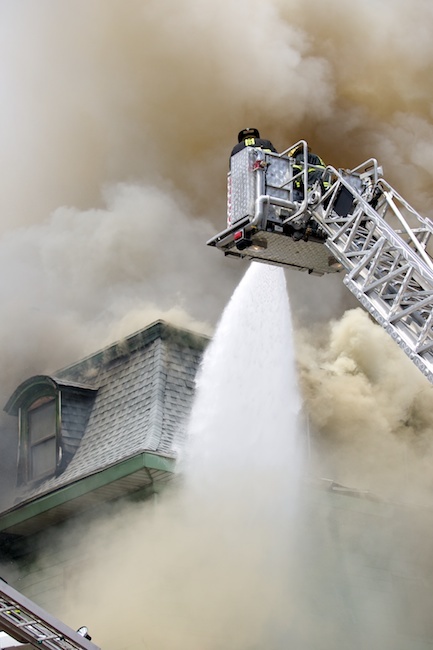 The fire started from unknown causes on the second floor of the old, wood-framed building and spread quickly, Marlborough Fire Chief Rick Plummer said. The building experienced multiple collapses, beginning with the roof and eventually imploded, but no injuries were reported and all firefighters were accounted for, Plummer said. 6.26.2010 — MARLBOROUGH, Mass. — Marlborough, Northborough and Hudson firefighters tend to the building at 173 Main St. in Marlborough as it implodes from damage due to an 8-alarm fire on June 26, 2010. 6.26.2010 — MARLBOROUGH, Mass. 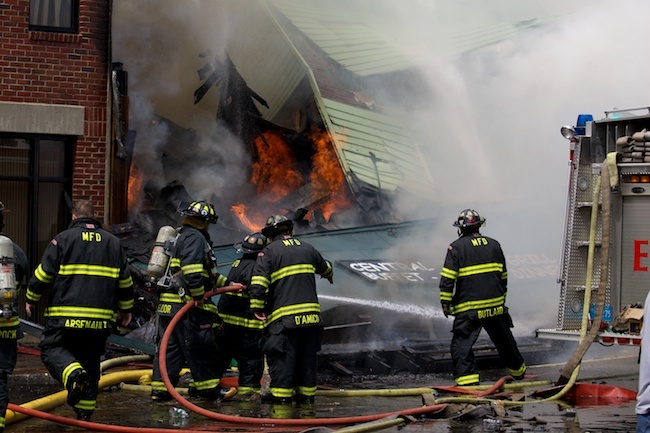 — Marlborough firefighters tend to the building at 173 Main St. in Marlborough after it imploded from damage due to an 8-alarm fire on June 26, 2010. 6.26.2010 — MARLBOROUGH, Mass. 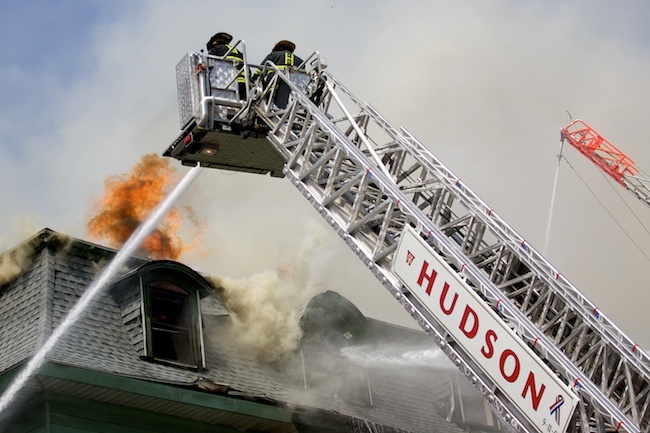 — Hudson firefighters assist their Marlborough colleagues with an 8-alarm fire at 173 Main St. in Marlborough on June 26, 2010. 6.26.2010 — MARLBOROUGH, Mass. 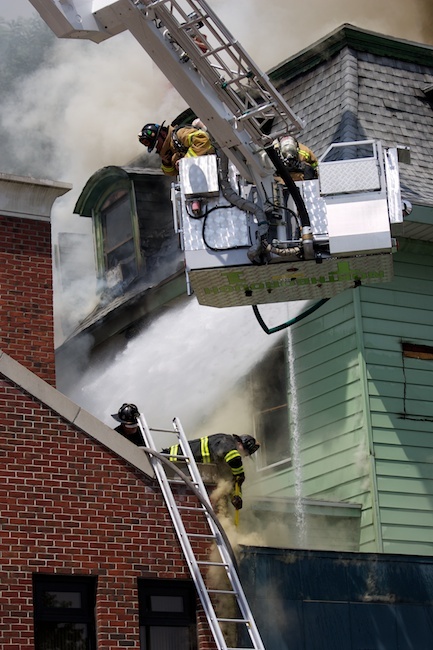 — Northborough firefighters, top, assist their Marlborough colleagues, below, with an 8-alarm fire at 173 Main St. in Marlborough on June 26, 2010. 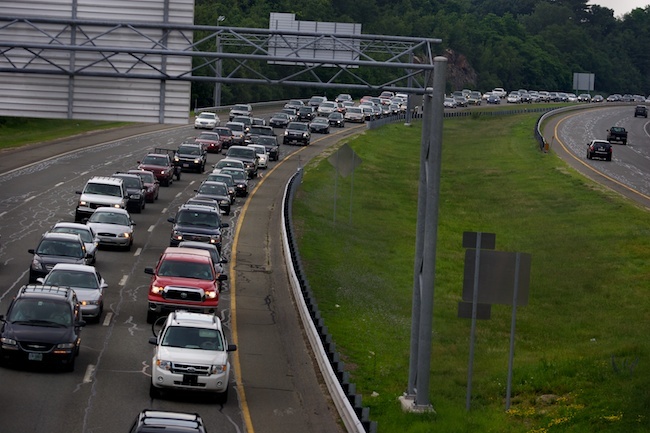 My apologies to anyone who had to drive south on I-95 coming back from New Hampshire Sunday afternoon. 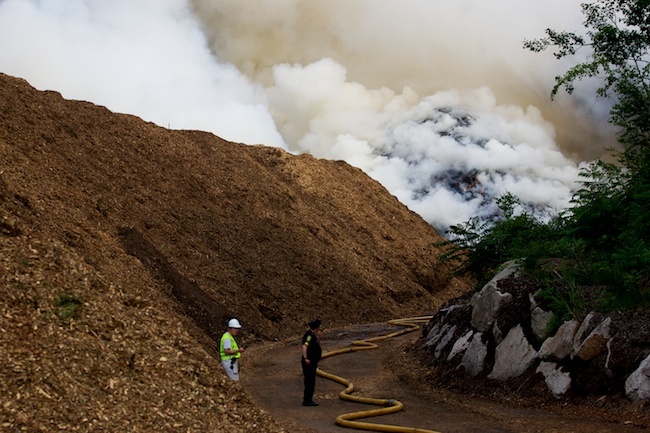 In case you were wondering what caused that backup, it was a huge burning pile of mulch in Peabody, just north of the I-95, Rt. 128 interchange. There were threats of to a tanker, and there had already been one explosion, so the State Police closed down Exit 45 due to the proximity of the mulch yard to the interstate. Nothing particularly exciting from me on this one — The best images came much earlier before they cut down access, but such is the reality when you’re hustling to Peabody from Boston. 6.20.2010 — PEABODY, Mass. — A mulch fire at the J.D. Raymond Co. in Peabody sent smoke onto I-95, shutting down exit 45 southbound and backing up traffic a considerable distance on June 20, 2010. 6.20.2010 — PEABODY, Mass. 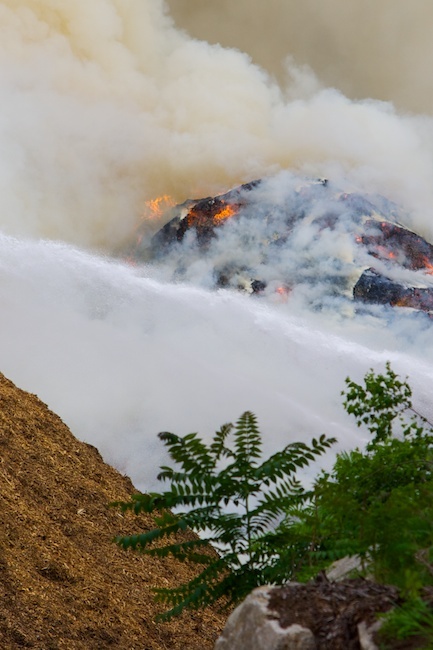 — A large pile of mulch burns at the J.D. Raymond Co. in Peabody on June 20, 2010. 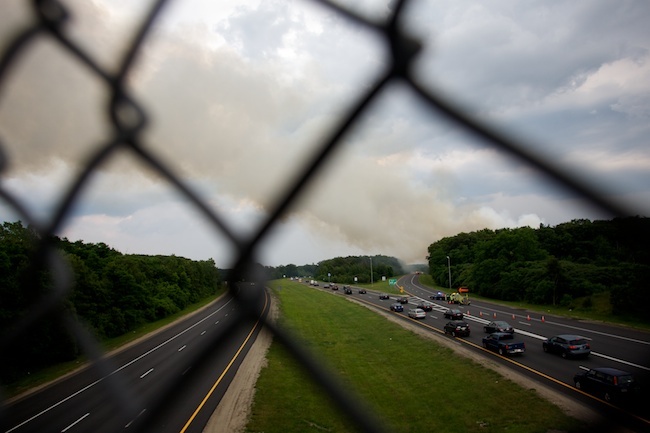 The smoke from the fire shut down exit 45 on I-95 southbound. Firefighters were initially worried about an oil tank on site and fire's proximity to I-95, which was 20 yards away from the its edge.